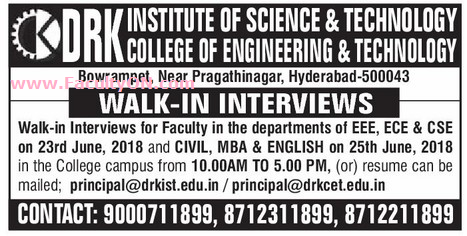 DRK College of Engineering and Technology, Hyderabad has advertised in the EENADU newspaper for the recruitment of Teaching Faculty- Professor / Associate Professor / Assistant Professor jobs vacancies. Interested and eligible job aspirants are requested to walk-in on 23rd and 25th June 2018 . Check out further more details below. College Profile: The era of success of DRK group of educational institutions has started way back in 2004 when it was established by Mr.D.B Chandra Sekhar Rao in the fond memory of his late father Sri Dasari Rama Kotaiah garu. Mr.D.B Chandra Shekar Rao an eminent & successful business personality, who has subsequently decided to focus on high quality education with the philanthropic motive, to act as a leader to promote economic & industrial growth of the country. How to Apply: The candidates are requested to appear for Walk-in interview along with their updated resume,originals & copies of certificates and recent PP size photos to the walk-in address provided below or resume can be mailed.